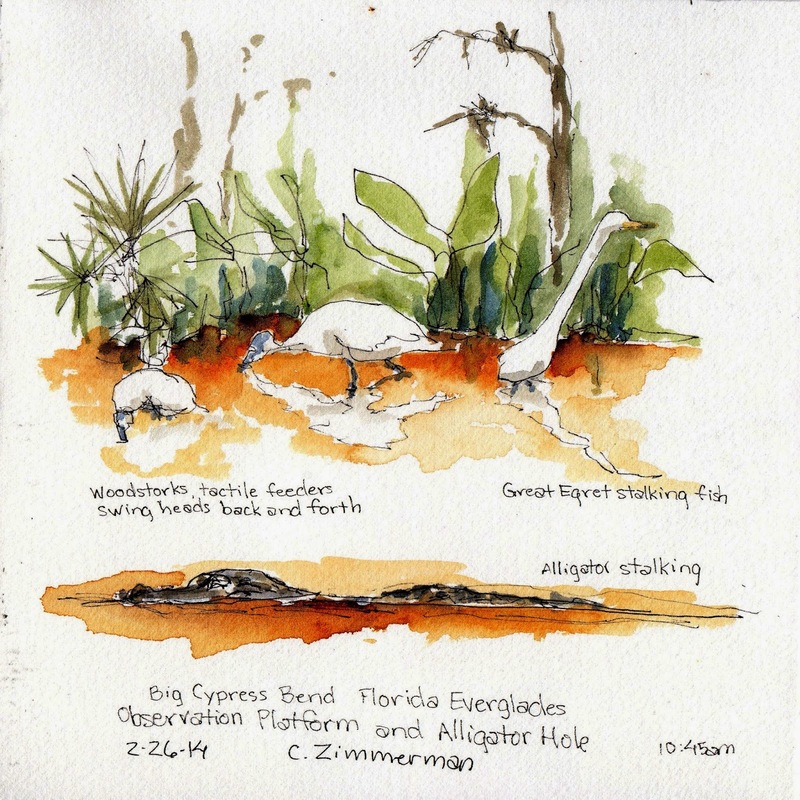 We spent two weeks birding in Florida south of Tampa to Sanibel, Naples, Bonita Springs, Marco Island and Flamingo in the Everglades. 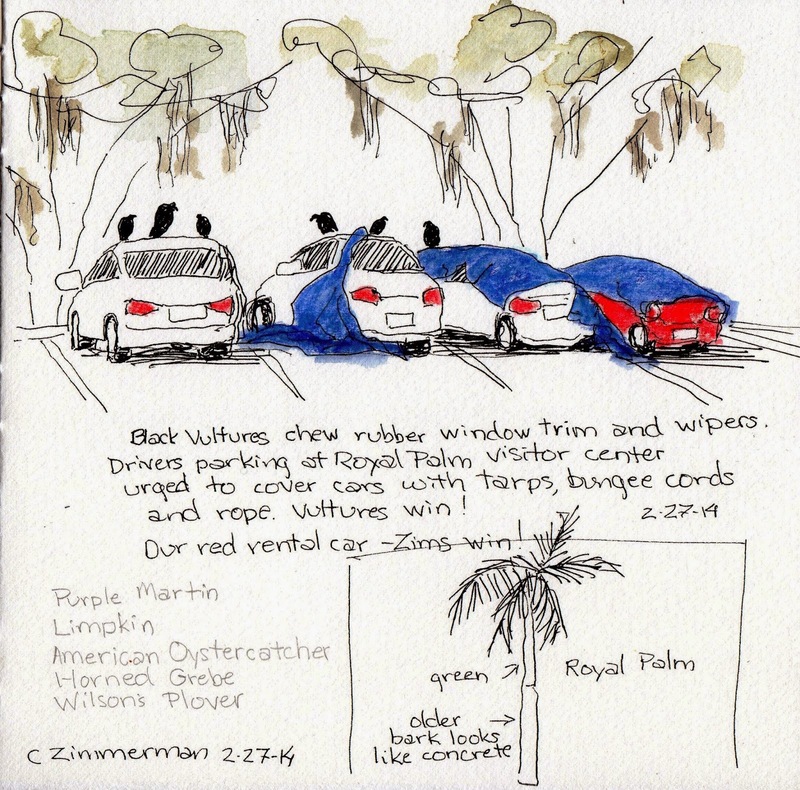 Challenges to field sketching were heat, humidity, crowds, lack of places to sit and bored vultures early morning who tear off blue tarps to chew off window trim and wiper blades. Fearing our $500 deductible, my sketch time was cut short to protect our rental car. Great Egrets and Snowy Egrets slowly stalked fish in the murky pond. Woodstorks being tactile feeders swung their heads back and forth to feel fish in their bills. Alligators lurked next to them. Sweat burned my eyes and dripped off my nose onto my sketch paper. 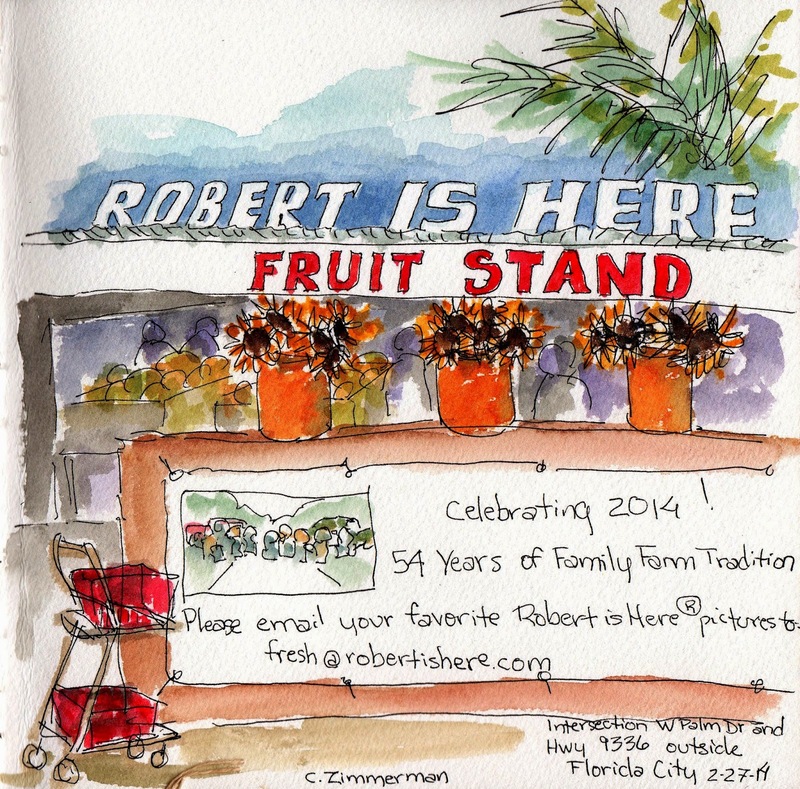 Just outside of Florida City before we entered the Everglades National Park is the well known fruit stand, Robert Is Here. Traffic moved fast at the intersection of Hwy 9336 and W.Palm Drive. Cars were constantly pulling in and backing out. I found a safe place to stand for 10 minutes between orange traffic cones and splashed some watercolor before I had to move. We picked up another bird species while I sketched, Purple Martins. Trip total = 134 bird species. Trip highlight was meeting Thomas "Thor" Thorspecken and discussing urban sketching over lunch! Love them. . . and the story. The sweat part sounds great right now as I sit bundled in my blanket on the couch. Great story and sketches! Hope you are having fun!